One of our key approaches is "Starting Right". We strive to ensure that all students are appropriately challenged and placed in the right level. 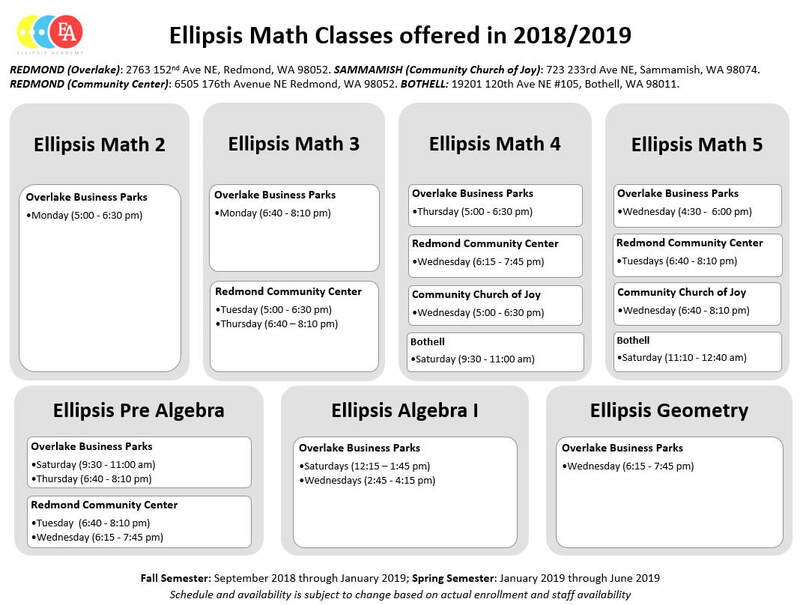 Since the Spring semester is a continuation from Fall semester, current Fall Ellipsis Math students do not need to take the placement test to continue to spring semester. All other students are required to take the FREE Placement test. NOTE: Current Fall Ellipsis Math students will receive an email with a link to register for the Spring semester in early January. NOTE: If you’ve never been to either of these locations before, allow for additional driving time to find this location. Please arrive 15 minutes early for check-in and seat assignments. Pencils and scratch papers will be provided. Please email Info@EllipsisAcademy.com if you have any question.